My patrilineal ancestors were Bilugunda Mookonda. Bilugunda (formerly known as Bonda) was the name of the village while Mookonda was the name of the clan. There are two Mookonda clans in Kodagu, one being the Mookonda of Devanagiri village near Virajpet town in Ede Naal naad and the other being the Mookonda of Bilugunda village near Ammathi town in Ammath naad. My family tree can be traced to the clans of my eight Kodava great grandparents - my paternal grandfather's father (Mookonda of Bilugunda village), my paternal grandfather's mother (either Madappanda or Kunjiyanda of Ammath naad, I am not sure at the moment), my paternal grandmother's father (Uddapanda of Ammath naad), my paternal grandmother's mother (Pemmanda of Kadnur village in Ede Naal naad), my maternal grandfather's father (Arpattu Mukkatira of Kadiyat naad), my maternal grandfather's mother (Bonda Mukkatira of Ammath naad), my maternal grandmother's father (Kotera of Murnaad) and my maternal grandmother's mother (Manduvanda) who is my earliest known matrilineal ancestor at present. The Rajas of Kodagu ruled the Kodagu region until 1834 (this digression is necessary for the sake of the account given below). There were three kings and one queen of this line in the early decades of the nineteenth century. Dodda Vira Rajendra (Vira Rajendra the elder) was a warrior king who had allied with the British East India Company and fought Tipu Sultan. He was not just a man of the sword but supposedly a man of letters as well, being a historian who chronicled the reign of his dynasty in a book. He was succeeded by his daughter Devammaji the only queen of the dynasty and a mere child. She reigned for only two years when she abdicated the throne in favour of her paternal uncle, Linga Rajendra II, the younger brother of Dodda Vira Rajendra. Linga Rajendra was a great game hunter, he ruled during times of peace. He was known for having renovated the palace and for constructing the Omkareshwara temple, unique because it is built in the Indo-Sarcenic style. Like his brother he too supposedly wrote a book, called the Hukum Nama, that laid down rules for his officers. However both the brothers might have employed ghost writers to have the respective books written. Chikka Vira Rajendra (Vira Rajendra the younger), Linga Rajendra's son who succeeded him, however got into trouble with the British East India Company. Kodagu was then annexed and the reign of the Haleri dynasty of Kodagu came to an end. Linga Rajendra and his chief queen Devaki had two daughters: Muddammaji and Devammaji (not to be confused with the queen and daughter of Dodda Vira Rajendra). The Queen Devaki was a daughter of the Palanganda Kodava family of Kantha Moornaad. In the court of Linga Rajendra was a palace official, the Head Munshi (Chief Accountant) of the Treasury under the Dewan (Principal Minister). His name was Mukkatira Muddayya, son of Mukkatira Aiyappa I, and he was a native of Bonda village (Bilugunda village was later formed from this village) in Ammathi naad. He had two younger brothers Ipanna (some sources say Aiyappanna) and Appayya (some sources say, Bopayya). They were the sons of one Mukkatira Aiyappa, mentioned in a Niroopa (decree) issued by Dodda Vira Rajendra and dated 1797. Muddayya was a favourite of the Raja and projected to be the future Dewan of Kodagu. Ipanna was a great marksman and horseman whose skill caught the eye of the Raja. The Raja, a sharpshooter himself, once tested him by ordering him to shoot down a bird perched upon the back of a distant bison. The Coorg successfully passed the challenge and pleased the Raja. Later the Raja had him race between Madikeri and Bhagamandala on horseback in record time. Ipanna was renamed Channa Basava by the Raja and at first betrothed to Muddammaji who however died young of sickness. So in 1819 Mukkatira Ipanna Channa Basava was remarried to Devammaji. He was titled Jahagirdar (feudal lord) and they were given the palace and estate of Appangala village. In 1820 Linga Rajendra died and Chikka Vira Rajendra, the half-brother of Devammaji (daughter of Linga Rajendra), became the next Raja. As Chikka Vira Rajendra was a very young man (who didn't have children until a decade later), his brother-in-law, Channa Basava, was made his heir. A dispute rose between them both in the early 1830s. Some supporters had wanted Channa Basava made the Raja. As a result of this Devammaji and Channa Basava were put under house arrest in their Appangala farm. Fearing for their lives the couple escaped from Kodagu into Periyapatna in Mysore one night. Eventually they were pensioned by the British East India Company (who were in the Mysore kingdom) and settled at Bangalore. This enraged Chikka Vira Rajendra who upon learning of their escape suspected Muddayya's involvement in their escape and had him executed. The Bonda Mukkatira family had become an influential clan which called itself a royal family. In 1834 Chikka Vira Rajendra was deposed and Kodagu came under British East India. Years later Channa Basava came back into Kodagu and lived at Appangala. He died and was succeeded by his wife and children. His two daughters were given in marriage to Palegaras (barons) in Mysore. The couple's only son had married but died childless. According to The Imperial Gazetteer of India (1908, page 15) Devammaji lived until she was 94 years and died in 1903, her son Somashekara had died before her. The Mukkati (Mukkatira) family presently at Appangala are the probable descendants of a daughter and heir of Chenna Basava and Devammaji. Meanwhile the Kodava families of Ipanna's brothers, Muddayya and Appayya, (the Bonda Mukkatira) continued to live on in the Ammathi naad region. Today the Bonda Mukkatira is a large family, said to be the largest Mukkatira family, with several family members. Only a few individuals relevant to this genealogy have been mentioned here. 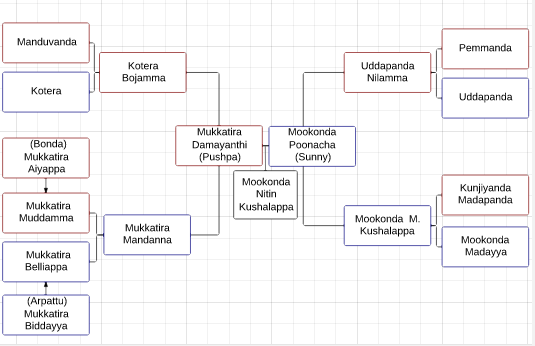 Some ancestors of the Bonda Mukkatira family (LucidChart). Mukkatira Aiyappa (Aiyamma) or Mukkatira Aiyappa II is (Bonda) Mukkatira Aiyappa in the previous family tree. 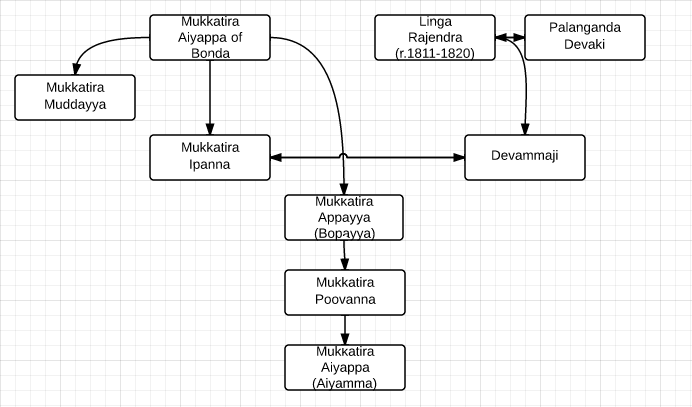 One direct descendant of Mukkatira Appayya (brother of Ipanna/ Chenna Basava) was Mukkatira Aiyappa II (named Aiyamma, according to some sources), his grandson, who married Ammavva, a lady of the Kodandera clan of Kunda village, and had four daughters. Kodandera Ammavva must have been an aunt or a grand aunt of the two Indian Generals, K. M. Cariappa and K. S. Thimmayya who were of the same Kodandera family from Kunda village. The youngest of her four daughters was Muddamma who was married to Mukkatira Belliappa, son of Mukkatira Biddayya, of Arpattu village in Kadiyat naad. The Mukkatira families of Bonda and Arpattu were unrelated. Four brothers were the progenitors of the Arpattu Mukkatira family. During the eighteenth century war against the Mysore Sultans who occupied Kodagu, the Kodava villagers of Arpattu and Palangala (who were militiamen) were outnumbered and pursued by the Sultan's soldiers. They took refuge in the temple of Malethirke in Kadiyat naad. The soldiers were scaling that heavily forested hill towards the temple which was at it's summit when a swarm of jungle bees attacked them. The soldiers fled the place and the Kodavas who came out from their refuge found the abandoned camp downhill. Here they helped themselves to the cache of arms of the enemy and went on to successfully fight away their pursuers. Among those warriors were the four Mukkatira brothers of Arpattu village, Karyakara (Officer) Appacha, Karyakara Monnappa, Biddayya and Muddayya, the last two were Desha Panchayath Thakka (Kodagu Council Chieftains). Many more brave soldiers came from the village of Arpattu. Centuries later two or three gunners from Arpattu village were to die in the twentieth century Indo-China War of the 1960s. Mukkatira Biddayya and his son Mukkatira Belliappa were descendants of one of these Arpattu Mukkatira brothers (who was also called Mukkatira Biddayya). The Arpattu Mukkatira Ain-mane (large ancestral homestead) that this family built is distinct as it has two Mundu-mane (central courtyards). Mukkatira Biddayya and his family lived away from the Ain-mane and in Kadanga village, which is near Arpattu. Mukkatira Belliappa was a schoolmaster who knew English, rode the countryside on horseback and taught at Kodlipet School. He and his wife Mukkatira Muddamma later moved from Kadanga village and settled down in Vontiangadi village in Ammathi naad. They had four sons, of whom only two survived into adulthood, and three daughters. The eldest daughter was married to a Pemmanda gentleman of Kadnur, the second to a Puggera gentleman of Devanagiri (in Virajpet), who for a while was the Deva Thakka (temple manager) of Bythoorappa (Baithurappa) village temple which is near the Karnataka-Kerala border, and the third to a Kabbachira gentleman. Bythoorappa is a chief deity for the Kodavas of Kodagu and the Puggera family were its hereditary Deva Takkas. The first son of Arpattu Mukkatira Belliappa was Mukkatira Chinnappa. The second of the two sons was my maternal grandfather Mukkatira Mandanna, an army man who had seen action during the Indo-China War of 1962. Before the war he was married to Kotera Bojamma of Moornaad. He dislocated his forearm during an accident in the same war. Yet he recovered from his injury at home and continued to serve in the army for a few more years. Later he returned to settle down with his family in Vontiangadi, to tend to the family property and become the elected village Sarpanch. Pardanda Ponnappa was the Dalavoi (General) of Dodda Virappa, a Kodagu Raja (r.1688-1736). Ponnappa's son Annaiah married a lady from the Kotera house. The temples and deities of Kodagu are of Kerala origin and associated with the Bythoorappa temple, so the Kodavas pilgrimage to this temple every year. Bythoorappa (Baithurappa) is known as Vayathur Mahadeva or Vayathur Kaliyar (Kali or Bhadrakali) Shiva of Ulikkal a village temple of Bythoor (Vayathur) region which is on the Kerala Kannur district side of the Kerala-Karnataka state border. The Kaliat Nambiar, who like the Kolathiri (Chera) Rajas were ancient allies of the Kodavas as the latter had a land trade with them in the past, were the chieftains of that region in Kerala. Hence the Bythoorappa (also called Vayathoorappan ) temple management comprised of Kodavas of Kodagu and Malayalis of Kerala. My maternal grandmother Mukkatira (nee Kotera) Bojamma's mother was from the Manduvanda family. Great Grandmother had a sister who was married to a Poyyetira clan gentleman. The Poyyetira couple had three daughters and lived near Gaddige, the tombs of the Kodagu Rajas, at Madikeri. Grandmother had two brothers and two sisters, the eldest was married to an Ammanukuttanda gentleman who for a while was the Devathakka (temple manager) of the chief village temple at Peggala, which is near the Karnataka-Kerala border (on the Karnataka Kodagu district side). The ancient Coorg men would pierce their ear lobes and wear thick gold hoop ear rings, like other ancient Hindus, but during the Raj they stopped this practise. Grandmother’s Manduvanda maternal uncles wore such traditional ear rings in the early twentieth century and chose to stop doing so after some time. In the late 1700s two Mandepanda brothers, Achchayya and Monnayya, lived in Chembebeloor with their mother Somavva. Monnayya was a Subahdar (governor of a Subah, or region, roughly equivalent to a taluk) under Dodda Vira Rajendra. Achchayya's fifth son Appayya was also a Subahdar under the same Raja. Mandepanda Appayya fought for the Raja against Tipu Sultan. He and his friend Na. Putta Gowda helped the Raja regain Madikeri fort and capture parts of Southern Hassan (in and around Manjarabad and Sakleshpura). However Appayya was killed in the war in 1790. Putta Gowda built a mausoleum in his memory at Mullusoge near Kushalnagar. Monnayya was honoured by the Raja with a ceremonial Oidekatti (native sword) for his bravery in the same war. Later Achchayya's sixth son Thimmayya was a Huzur Munshi (Chief Accountant) who learnt Hindustani (Hindi and Urdu) and Persian. He married a Haleri (the Rajas' dynasty) princess and was one of the few Kodava vegetarians of his times. He was retained in the government when the British took over Kodagu in 1834. He and former Subahdar Monnayya were part of the native police force that helped quell the Coorg Rebellion in 1837. Between 1847 and 1856 Thimmayya became the Head Shrestidar in Madikeri, under the British Commisioners. Being the highest ranked native official of his times, Thimmayya was addressed as the Diwan by the people of Kodagu. After his death a Haleri style tomb was built for him in Chembebeloor. Thus the Mandepanda family of Chembebeloor came to be called the Gori ('tomb') Mandepanda. Thimmayya had land in Ammathi Vontiangadi. Achchayya's first son (Thimmayya's eldest brother) Parupatyagara Appayya and last son (Thimmayya's youngest brother) Muddayya, both moved out of Chembebeloor and settled down in their lands in Bilugunda village (formerly called Bonda). Mandepanda Muddayya's elder daughter was married into the Bilugunda Mookonda family, who owned farmlands in the neighbourhood. Muddayya's second son's (Mandepanda Aiyamma's) second daughter was also married into the same family (Bilugunda Mookonda). Bonda was a village of 300 families before it was split into the smaller village of Nalvathokkalu (meaning 'forty clans') and the larger village of Bilugunda, hence it was called Bonda Moonooru Okka ('Bonda 300 clans'). There was a third village, Pudikote (or Hoskote), as well which was carved out of the old village of Bonda, but it was too small to be a significant village. One of the original 300 families was the Bonda Mukkatira (the same clan in which Muddayya and Ipanna were born) and another was the Bilugunda Mookonda. The Bonda Mukkatira live in what is today Nalvathokkalu. They were the Deva thakkas (temple managers) of the village temple. In Bilugunda existed one Ur guppe (village group of settlements) where one Kodava Palegara (chieftain), one Airi (carpenter and village smith, the Airira) and seven Kodava ryot (agriculturist) families lived together as a cluster of settlements. They were the Palegara who was of the Uddichanda clan and eight other clans: the Mandepanda, the Iynanda, the Madappanda, the Nellachanda, the Uppangada, the Kopuda, the Airira and the Mookonda. During the reign of Tipu Sultan in the late eighteenth century, many of the original 300 families including the Uddichanda Palegara family were completely destroyed. Khader Khan Kaisigi, a friend of Dodda Vira Rajendra, the Raja of Kodagu, was given the lands of the Uddichanda. Khader Khan's descendants would wear the Kodava Kuppya Chele and take the place of the extinct family in all village festivities, including at the Putthari (harvest) dance at the nad mund (village green). The Bilugunda Mookonda were the Ur Patel (hereditary village headmen) of the Bilgunda village, located near Ammathi. The Iynanda clan was the Aruva (a friendly neighboring clan who assisted in religious cultural rituals and ceremonies and who was also the traditional matchmaker) for the Mookonda and like wise the Mookonda were the Aruva for the Iynanda. Near what is now the Bilugunda Kodava Samaja (ceremonial hall) beside the Iynanda lands was a Kaimada (shrine) dedicated to the Mookonda ancestors. This shrine was in a bad shape until recently. Five brothers who lived in the nineteenth century gave rise to the present day Bilugunda Mookonda clan. The eldest of these five brothers, Mookonda Nanjappa, had four sons. One of them was named Mookonda Madaiah (Senior). Madaiah, his brother and a paternal cousin moved from Bilugunda, to the neighbouring hamlet of Mundoni. The neighbours of the Mookonda in Mundoni were the Iynanda, the Nellamakkada and the Mandepanda. Madaiah had two sons, Cariappa (pronounced ‘Kaaryappa’) and Kushalappa (‘Kushaalappa’). Mookonda Cariappa (Senior), who was the Patedar (clan elder) of the Mookonda family, was the last Patel of Bilugunda, after him the hereditary office was stopped. Mookonda Kushalappa (Senior), a teetotaller, became the elected Sarpanch of Bilugunda. In the past, brothers and their respective families would live together as a joint family under the same roof. In Kadnur lived such brothers of the Pemmanda house. One had two sons and a daughter while another had two daughters. A son of the first brother became the renowned South Indian police chief Rao Bahadur Pemmanda K. Monnappa. One daughter of the other brother was my great grandmother. She married a gentleman of the Uddapanda family of Ammathi. Her sister married a Kavadichanda gentleman. The Uddapanda couple had two daughters and a son, the son was later a police chief. The younger daughter was married to a Kuppachira gentleman. The elder daughter, my paternal grandmother, was married to my paternal grandfather Mookonda Kushalappa (Senior). According to tradition, I was named after my paternal grandfather at birth; the eldest patrilineal grandson usually gets the name of his deceased paternal grandfather. So I am Mookonda Kushalappa (Junior). My personal name (Nitin) was given to me by my maternal grandfather. He was in Bengal for some time during his tenure in the army. Many years later when Nitin Bose, a famous Bengali and Hindi script writer and film maker, died the year I was born, I was named after him. I would like to thank my maternal grandparents, Mukkatira Bojamma and the late Mandanna, my parents, Mookonda Pushpa (Damayanthi) and Poonacha (Sunny), and my relatives for sharing this family history with me. This work has been a basic attempt at studying genealogies and is an act of remembering the dead. It is a tribute being paid to one's ancestors whose names would otherwise disappear into oblivion. Among the well distinguished individuals mentioned in this genealogy are Jahagirdar Mukkatira Ipanna (also called Aiyappanna or Chenna Basava) and Rao Bahadur P. K. Monnappa, who are distantly related to my parents, most of the other men were landowning ryots (farmers) and sepoys (soldiers). The Malethirke temple incident concerning the villages of Arpattu and Palangala has also been described by C (Cheppudira) P Belliappa in his first book. The family history of the Bilugunda Mookonda is from what family members and relatives have to say and from Bovverianda Nanjamma and Chinnappa's website Ainmanes.com and well detailed notes. Mukkatira Muddayya and Jahagirdar Mukkatira Ipanna, as well as the Rajas (princes) of Kodagu, have been described by various sources such as D. N. Krishnayya's history book in Kannada Kodagina Ittihasa, G. Richter's book Manual of Coorg popularly known as the Gazetteer of Coorg, I. M. Muthanna's book The Coorg Memoirs (the story of the Kodavas), Masti Venkatesh Iyengar's historical Kannada novel Chikka Vira Rajendra, Haridasa Bonda Mukkatira Subbayya Poovayya's 1960 family genealogy in Kannada, Bovverianda Nanjamma and Chinnappa's website Ainmanes.com and Iynanda Dhanu's Kodava thakk article published in the Brahmagiri periodical. Richter's 1870 Gazetteer of Coorg, Nadikerianda Chinnappa's 1924 Pattole Palame, Mandepanda Kutumbada Vamshavali Pustaka (Mandepanda family history book) by Mandepanda M. Kushalappa in 2002, speak of Mandepanda Monnayya, Mandepanda Appayya, Mandepanda Thimmayya and their relatives. Had family tree diagrams been used the narration would have been easier to understand. www,familyecho.com may be tried. Sure, it can be done. Nitin...you have amazing knowledge...'m you fan! !